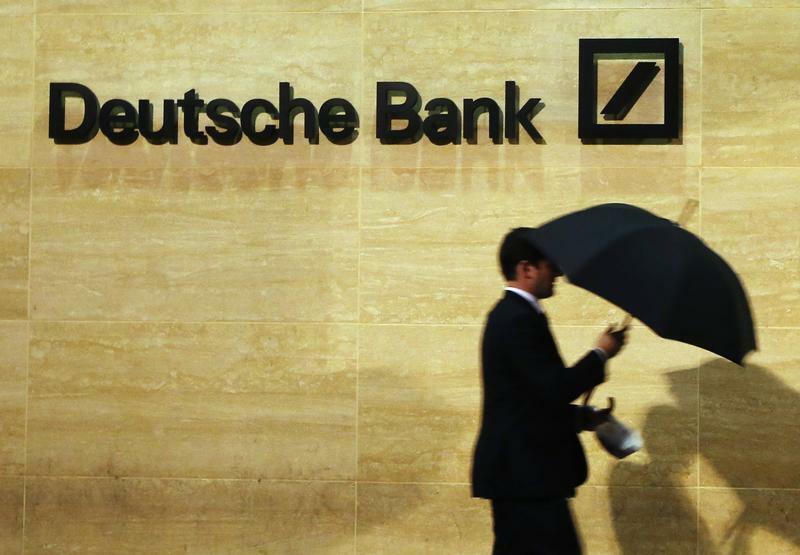 Deutsche Bank investors are being asked to wait for slim pickings. Germany’s largest lender said on April 27 it would cut investment banking assets by 200 billion euros ($217 billion), jettison its underperforming Postbank retail subsidiary, and find 3.5 billion euros in new savings by 2020. The upside is much-improved capital strength. The downside is unexciting returns. That Deutsche felt the need to commit to a 5 percent equity-to-assets threshold is striking. Minimum requirements for this so-called leverage ratio are currently 3 percent in Europe, and French banks have long viewed it as less important than risk-weighted measures. Yet Wall Street banks have leverage ratios at or above 5 percent, while smaller European banks are closer to 6 percent. Larger European institutions will now fret they have to follow Deutsche’s lead. For Deutsche investors, higher capital means lower returns. Because asset reductions only take Deutsche’s leverage ratio to 4.6 percent, the rest has to come from retaining earnings. Hence it can only commit to exceeding a 10 percent return on tangible equity – below rivals who seek above 12 percent. An aspiration to pay out at least 50 percent of earnings in dividends couldn’t stop Deutsche shares falling over 4 percent on the morning of April 27. Deutsche investors have another reason to worry. By deciding against a dramatic UBS-style exit of business lines, co-Chief Executives Anshu Jain and Juergen Fitschen have to cut relationships with unprofitable clients and reduce high leverage, low-margin activity in repo lending and long-dated derivatives. Given this can be the gateway to higher margin business, the risk is reduced return goals become harder to hit. Investment banking investments elsewhere may help, but will reduce net asset reduction to between 130 billion and 150 billion euros. The good news is that Deutsche only needs to make 27 billion euros in revenue on its ex-Postbank 2014 cost base to hit its 65 percent cost-to-income ratio target, 1 billion euros less than last year. But currency fluctuations contributed to adjusted expenses increasing 12 percent in the first quarter year-on-year, and regulatory expenses are still rising. Deutsche is doing the right thing, but investors will only tolerate the low-ball returns if the new plan’s execution is hitch-free. A man walks past Deutsche Bank offices in London. Shares in Deutsche Bank fell over 4 percent on April 27, after Germany’s biggest lender unveiled a new five-year strategy that will see it cut 200 billion euros ($217 billion) of investment banking assets, exit its underperforming Postbank retail subsidiary and find 3.5 billion euros in new savings. Over the next two to five years, it aims to deliver a return on tangible equity of more than 10 percent, a leverage ratio of or above 5 percent, a cost-to-income ratio of around 65 percent, and a common equity Tier 1 ratio of about 11 percent. Deutsche also pledged to pay investors at least 50 percent of earnings as a dividend. The bank said it would reinvest 50 to 70 billion euros of assets in investment banking, taking the net reduction of assets to between 130 billion and 150 billion euros. It also said that it would invest 1 billion euros into digital technologies, as well as 1.5 billion euros to grow its transactional banking and wealth and asset management businesses. It will also reduce the number of countries it operates in from 70 today to between 60 and 63. It said the cost savings it targeted would carry a one-off cost of 3.7 billion euros. By 1045 GMT on April 27, Deutsche Bank shares stood 4.2 percent lower at 30.2 euros.